A real revolution in the world of espresso, the Lavazza Blue capsules, allow everyone to enjoy "the embodiment of espresso" any time, anywhere. So wherever you are you can enjoy a tasty Lavazza Blue espresso with incomparable crema. Pack of 50 Lavazza BLUE LEMON FLAVOURED BLACK TEA capsules, compatible with Lavazza BLUE machines. A soluble blend of Premium black teas, slightly sweetened and lemon flavoured. Pack of 50 Lavazza BLUE Bevanda Bianca capsules compatible with Lavazza BLUE machines. Sweet milk powder capsules for a delicious drink. Lavazza BLUE Very B MAGNIFICO pack x300 capsules. Lavazza BLUE Very B SUPREMO pack x300 capsules. 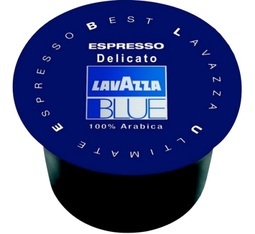 Lavazza BLUE Very B SUPREMO pack x600 capsules. Lavazza BLUE Very B MAGNIFICO pack x 600 capsules. 50 x Lavazza instant CHOCOLATE sachets + 50 Bevanda Bianca milk capsules from the Lavazza BLUE range, compatible with Lavazza BLUE machines.